Things You Need to Know About Living in Texas! Did You Just Move to Texas? Moving to a new state, or even a new country, can be difficult. There are so many things to learn about the area. And then you hear rumors...is it true someone can shoot you just for stepping onto their property without permission? Are there really spiders here that'll kill you? Where do you go in a tornado? Who fixes the fence between neighbors? Where can I go to get a large yard? Since everything in Texas is big, most notably the state, we'll focus on Collin County which includes the major cities of Allen, Frisco, McKinney and Plano, although some of this may be an overlap with other regions of the great state of Texas. For the most common questions, we reached out to our neighbors through NextDoor© to ask them what they felt anyone moving to this area would need to know. This author moved to Collin County in 2011 and absolutely loves it! Why? Because the weather is great ten months out of the year, the people are amazing, and everything you could want to purchase is within just a few miles. (And Texas has a beach, too!) So keep an open mind as we share with you some of the idiosyncrasies of settling into Collin County. You've probably heard that Texas is a part of the Bible Belt and DFW is the "Buckle of the Bible Belt". Depending upon what article you read, the extent to which this is true varies. But one cannot argue with the steeples and mega churches on seemingly every corner of every street in Collin County. Christians believe the Bible to be the inspired Word of God and Christian churches teach the Scriptures to congregants and attendees through various formats including lectures (known as sermons), music, and Bible study. If you choose to attend a service, you typically will enter through a lobby to a second set of doors where there will be benches (pews) facing the platform. There will be times to stand and sing, either from a book (hymnal) or a screen at the front of the church. During the sermon, attendees are seated. Services can vary between forty-five minutes to one and a half hours, typically dependent upon the denomination. Acceptable attire is a nice pair of jeans with a dress shirt or business casual clothing. The people here are nice! Also, Collin County residents have a literal buffet of churches from which to choose including denominations, music style, with-or-without coffee shops, etc. And there's a good chance that the pastor you've been listening to on the radio is within a short driving distance of your home. These churches offer wonderful, mostly free festivals and programs for adults and children and a sense of community. It also means that when you run into a stranger at the grocery store, they just may ask you, "what church do you attend?" Don't be shocked; it's pretty typical. Shop 'til You Drop visiting the various churches until you find one that fits you and your family. If you don't desire to attend a church service, you are still welcome to join the programs offered by the church. There is never a cost to attend a church service and you do not need to put anything in the offering plate when it is passed. Programs may have a cost associated with them, but often they, too, are offered at no cost without expectation of payment. Visit the churches' websites to learn more about their programs and any associated costs. So many people drop in as visitors that you may be able to slip in without being noticed. 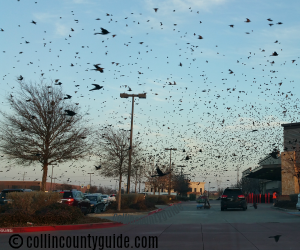 A real-life, albeit tame version, of the Hitchcock film "The Birds" seems to replay each winter in Dallas as thousands of blackbirds can be seen perching on light poles and roosting in trees. The reason? Texas is part of the Central Flyway. They do not pose a threat to humans. It's fun to watch the birds and listen to their chatter. Laws dating back to the Puritans had prevented the sale of particular goods on Sundays, presumably to observe Sunday as the Sabbath day of rest. Today only the sale of two items are still restricted: liquor and autos. While Texas Liquor laws have changed substantially in recent years, there are still some restrictions. Beer and wine may be purchased at grocery and liquor stores. Liquor stores are closed on Sundays. If you would like to purchase alcohol on Sunday mornings, you may do so at a sports venue, festival, fair, concert, or restaurant (with food). Click on the link above for specific legal hours for public consumption of alcohol as well as other interesting alcohol-related laws. Car dealerships may not, on consecutive days of Saturday and Sunday, sell or offer for sale a motor vehicle. Transportation Code 728.002. So most dealerships are closed on Sundays. It seems nostalgic to live in a section of the country that still reveres Sunday as a time for family. Can Someone Really Shoot Me Just for Stepping onto Their Property in Texas? Not quite, but if they believe you pose a threat to their home or their property, then yes. Read the law here. Bottom line: Best to stay off of other people's property in Texas. Say you're driving along a country road and you see an open field with cotton growing in it. You'd like to take home a couple of stalks; can you? Well, no, because it is criminal trespass to enter onto Agricultural land. Be aware of other indicators such as purple paint on a tree or fence post or a No Trespassing sign. Read the law here. Native Texans are quick to explain that they are friendly and the only aggressive drivers you'll find are the transplants. Obtain insurance for your vehicle. Take proof of this insurance to an inspection station to have your vehicle inspected. Take both proof of vehicle inspection AND your insurance to register your vehicle. Take the vehicle registration and proof of insurance to obtain your drivers license. When you visit the DMV for the first time to obtain your new drivers license, know that this may take several hours as not all customer service representatives at the DMV issue new licenses. You can get in line before you even leave your home by clicking here. The good news is that out-of-state drivers over 18 should not need to pass a written or drivers test. And, the extra time provides an opportunity to slow down and get caught up in a good book. Are there earthquakes in Texas? Yes. But according to the USGS, no earthquakes have been recorded in Collin County from 1973 and July 18, 2018 (the date of this article). The closest earthquake to Collin County was 2.5 in Little Elm on Feb 13, 2018. According to the USGS, Collin County has an expected number of 2-4 occurrences of damaging earthquake shaking in 10,000 years. (Los Angeles has a greater than 250.) No fault lines have been found in Collin County. See here. CLick here for The TexNet Earthquake Catalog, a dynamic mapping web page that provides information on the location of monitoring stations and recorded earthquakes across the state. You'll typically find either wood fences (smaller lots) or wrought iron fences (larger lots) within HOA-managed communities. While serving on an HOA board, I was informed by the management company that "everyone knows" fences running between property lines in a neighborhood are the shared responsibility of the homeowners whose properties meet on that line. Apparently, it's a "Texas thing". After investigating this further, I learned this is something that management companies and the city do not control and that this falls under the heading "neighbor dispute" when there is a disagreement. Fences provide privacy allowing homeowners to create their own little secret gardens behind their fences. If you notice the fence requires replacing on a home you'd like to purchase, this can be a negotiating tool for several thousand dollars. A power gate adds more. 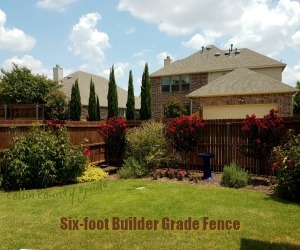 If the fence is no longer straight or requires staining, it is possible the HOA has provided a notice the fence needs to be brought "into compliance." Whenever possible, get to know your neighbor to establish a friendly relationship. Thus, when neighborly disputes such as this arises, you should be able to work this out. If your neighbor refuses to work with you and you find that the fence is in violation of an HOA rule or city ordinance, then the appropriate governing organization may get involved. This isn't just a sport here, it is part of the culture. High school stadiums in the four main cities rival professional sporting stadiums, with Frisco's high school football teams actually playing at the Dallas Cowboys $260 million practice stadium. Allen's infamous $60-million stadium (seating 18,000), McKinney's new stadium ($70-million, seating 12,000), and Plano's stadium (built in 1977 and seating over 14,000) are testament to the importance of football in Collin County, TX. Family-friendly, hometown fun is easy to enjoy close to home. There are 31 cities and towns within the boundaries of Collin County. If you fall within one of those municipalities, the city or town is your first rule of government. Collin County governs those cities as well as the unincorporated areas. Collin County lies within the great state of Texas, which lies within the United States. Did we get your attention with the photo? 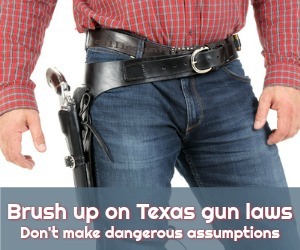 While Texas does permit open carry, your best chance of finding someone with a gun strapped to their hip in Collin County would be in a rural area at a ranch or at the movie theater. But, chances are, unless a sign specifically prohibits the carrying of a gun on private property, the folks sitting next to you in church are probably armed. Does this mean that Texas, and Collin County specifically, is a free for all with gun rights? Not exactly. While Texas is an "open carry" and "concealed carry" state, there are specific laws that determine what you can and cannot do with a gun. 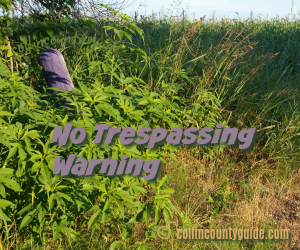 Whatever your preconceptions, Collin County is not filled with gunfighters and cowboys on every corner. Brush up on Texas gun laws here and be sure to check the governing authority of the municipality in which you live (noted above under "Government"). To learn more about obtaining a gun license in Texas, visit the Dept. of Public Safety. Whether you love them or hate them, they are prevalent in the North Dallas area. A Homeowners Association (HOA) is an association made of up the homeowners living within a specific development. Once the developer has completed the build out of the subdivision, a board is either elected or appointed--depending upon the governing documents of the association. Typically once the builder moves on, the board is comprised of a volunteer group of homeowners living within the neighborhood. What are your responsibilities living within an HOA-managed community? 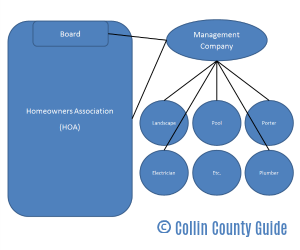 Understand that HOA membership is typically mandatory in an HOA-managed community. If you break the rules, you will receive notices and fines--which can add up to be substantial. Here's the bottom line: If the rule is in the documents, the board and management company do not have the authority to change the rule--unless the documents state they do. The documents would outline what must be done to change the rule. Many, but not all, HOA-managed communities have a pool, clubhouse, private parks or other amenities closed to the public. Most HOAs also have organized events, which create opportunities to meet your neighbors and feel a part of your community. Most of these events are organized by volunteers and funded by the HOA, which provides ample opportunity to get involved. Most importantly, you don't have to talk to your neighbor about trimming his lawn or taking down some (in your opinion) hideous statue; that's handled by the management company. Before purchasing your home, obtain a copy of the governing documents (Articles of Incorporation, Bylaws, Declarations, and Design Guidelines at a minimum). This is in bold because sometimes the developer or realtor will tell you that you will receive these at closing. This is not something you should wait to receive until closing. Regulations are typically strictly enforced, so you'll want to know what they are before you move in. Plan to follow the rules. Attend the board meetings as an observer, run for the board, get involved in the community social committee, Architectural Review Committee, or Neighborhood Watch so you are known to the management company and board as a contributing part of the community. This goes a long way if you do have a disagreement with the management company. If you would rather not live under the rules of an HOA, consider moving out into the country or purchasing an older home that is not part of an HOA-managed community. Read this article about Texas HOAs. A quick search on Realtor.com for homes for sale in Collin County, TX yielded a result of over 24,000 homes. Add a basement requirement and the result is zero. Why? We're told it is due to soil movement in this area. While media rooms may be a luxury in some parts of the country, the "extra room" often comes pre-wired for a home theater. If your concern is where to go during a tornado, in-ground and above ground shelters are available for purchase and install. While everything seems bigger in Texas, this does not apply to the size of the yards within heavily populated areas. Where I grew up in Wisconsin, a quarter acre was considered small and only found within city limits. 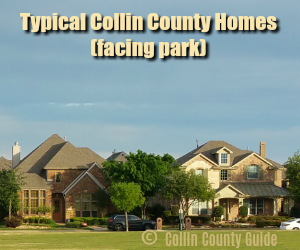 Here in Collin County, a quarter acre is considered a large lot in new home neighborhoods. If you want to maintain a lawn, you need to water the grass--and cut it. If spending your weekends working on the yard isn't your thing, the smaller the yard, the more time you have to do other things. Parks, trails, and playgrounds are found throughout neighborhoods. If a larger yard is on your must-have list, your realtor will probably be focusing his/her search in rural areas for new homes or in long-established neighborhoods (older homes). 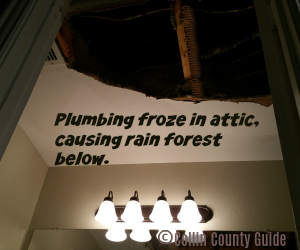 Many homes in our area were built with plumbing and a water heater located in the attic. While this is convenient to keep the water heater out of your garage or second floor closet, there is potential for the plumbing to freeze and burst, causing extensive damage. Are you looking for a home that has a window over the kitchen sink? That means your plumbing is running on an outside wall--which could be troublesome during a winter freeze. The photo on this page of the blown out ceiling resulted from plumbing that froze and burst. Because the home was unoccupied, the water leak flowed freely until a neighbor discovered the water on the front sidewalk. By this time, the water had created a rain forest in the home, flooding just about every room in the house and causing extensive damage. The easiest thing is to keep your heat turned up on your second floor, even when you are away. During long periods of cold, or before leaving your home in the winter, open the cabinet doors to all plumbing--especially plumbing located on exterior walls. Speak to a reputable contractor about things you can do to prevent this from happening in your home. In Texas, property taxes increase with property values. The tax rate will vary between cities and school districts as each set their rates within legal limits. This can result in property taxes increasing by several thousand dollars within just a few years. If you are interested in purchasing an existing home, visit the Collin Central Appraisal District's website to view the value history on the property. If you are purchasing a new home, be aware that the value shown may be the undeveloped land price and will be adjusted with your closing. Ask the district for the estimated property tax bill based on the purchase price of your home. When you receive your annual tax valuation in April, create an account online using the PIN sent to you in your Notice of Appraised Value. Check BOTH "over market value" and "unequal appraisal" to allow you to present the widest types of evidence and preserve your full appeal rights. Make sure to check for the deadline on the notice. Always request the evidence that was used to determine your property value. By following these steps, you can determine if the appraisal was accurate or you have grounds to dispute it. Use the NextDoor app or your community's Facebook page for free and paid resources to dispute the appraisal. Tip: Visit the Appraisal office and meet with an appraiser prior to your hearing date. If you have gathered the proper evidence, you may receive a reduced appraisal and avoid appearing at the formal hearing where dialogue opportunity is limited. Admittedly, this can happen no matter where you live. If you hear scurrying, scratching or thumping in your home, the time of day you hear it will help you to define what may have taken up residence in your attic. Daytime noise? Most likely squirrels are in the attic. Night time noise? It could be rats, raccoons or opossums--event bats. Chances are your neighbors have dealt with the issue and can refer you to an animal removal service to assist you. You'll want to remove them before they cause damage chewing through wiring and other parts of your home. Keep trees and large vines trimmed away from your roof line to reduce the potential for this problem. Yes, you read that correctly. When you purchase your home, it is best to receive instructions from the builder's rep during your walk-thru or if purchasing an existing home, from a foundation professional on how to do this properly. Due to the soil movement in Texas, it is advised that you water your foundation to keep your foundation from buckling or cracking. A damaged foundation can be a costly repair, but a little prevention can go a long way. There is NO state income tax in Texas or in Collin County. We get to keep more of our hard-earned dollars! Texas taxes on what you consume (property tax, sales tax) and not on what you earn. Residents get to choose how to spend their money. Have you been wondering, "What is that noise outside in the summer?!" You're not alone. For most people new to Texas it's a little creepy to hear strange noises coming from trees in the summer. The noise is the "song" of the male cicada attempting to attract a mate. You will hear them mostly in July-August. You can read more about them here. While the cicadas are harmless to humans, be aware that they draw predators you won't want to encounter: the cicada-killer wasp, which flies low to the ground and the venomous copperhead snake (more here). If you have large trees in your yard, copperheads like to sit at the base and wait for the cicada larvae to emerge from the roots and head up the tree. This is particularly true of White Oaks. Prime feeding months are June thru September, dusk (about 9pm) to midnight. So watch your feet! 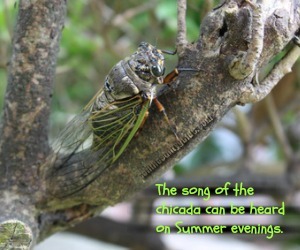 Enjoy the summer sounds of the cicada and, when walking at night, take a flashlight with you. The Dallas North Tollway is the exception, but also is referred to as "the DNT" or simply "the Tollway". For more information on our tollways, see "Tollways" below. Yes, Texas does have their share of venomous spiders and snakes, fire ants, ticks and mosquitoes. We've dedicated a full page to this topic here. We've also created a page on the snakes found in our area here so you can learn the difference between the "good" snakes that actually prey on the "bad" snakes. Purchasing a home located in a rural setting or backing up to a stream or wooded area increases the opportunity to encounter native wildlife. While living in the city on an interior lot is not a guarantee you will avoid unwanted encounters, it may reduce your chances. Whether this is common in other areas could be debated, but one of the drawbacks of living in cities that receive national press coverage (such as ours) for being "the best" and "most affluent" is the draw it is to thieves. While these issues are not isolated to Collin County, TX, there are things about our area that make theft rather easy for would-be thieves such as alleys, busy parents dropping off their kids at childcare, two-income families leaving their homes vacant during the day, etc. As residents, there are things you can do to protect yourself. Package Thieves: Open a local PO box either at USPS or the local mailbox store. They'll accept your packages for you and hold them until you can pick them up. Alternately, ask a neighbor to pick up your package if you can't be home to receive it. Personal items from your auto: Make it a habit to lock your car doors, even if walking in the house for five minutes. Don't leave anything valuable (and tempting) visible--including your handbag, Ladies, when dropping the kids off at daycare. When parking your auto on the street or in the driveway overnight, be sure to double check you've locked the door. Homeowners' cameras have caught prowlers checking car doors. Garage Doors: Close your garage door, even if you are just going in the house for a few minutes or walking outside to the other side of the house. If you do not wish to lock your garage door, be sure you lock the door between the house and the garage. The Allen Police Department provided this video of a 20-year career burglar's interview sharing what draws him to specific homes and neighborhoods. Several of the major highways through Collin County are actually tollways and include the Dallas North Tollway (DNT) and the Sam Rayburn Tollway (121). Depending upon where you need to drive and how often, you can quite easily incur a $200/mo toll expense. The cameras located near the toll tag readers will record your license plate and send an invoice to drivers who have not obtained a toll tag (in-state and out-of-state drivers)--at a substantially higher rate than cars with toll tags. Texas does not have state income tax so these roads are privately maintained. 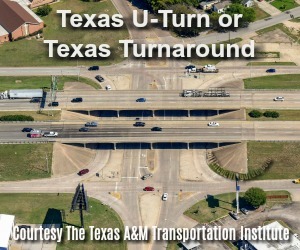 You can choose to stay off the tollways and save money. When driving on the tollway, free emergency road service is available by dialing #999. 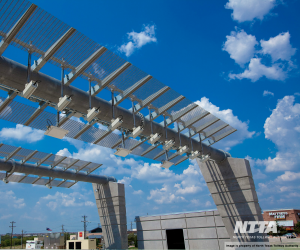 NTTA TollTags can be used at DFW Airport and in Oklahoma, saving you time. Each Spring the North Texas Municipal Water District (NTMWD) performs preventive maintenance on the drinking water system. NTMWD uses chloramines for their distribution disinfectant, but during this 28-day period switch to free chlorine, temporarily removing ammonia. This can result in a strong chlorine smell in your water. During the warm summers in Texas, tap water tends to come out of the faucet at a warm (rather than cool) temperature. According to the NTMWD, the temperature of water at the tap is significantly related to the temperature of source water. In places like North Texas, area lake water, which is the most common source of drinking water, can warm significantly during the sweltering days and hot nights and that warmer water temperature can be noticeable at the tap. Weather.gov advises that during a Severe Thunderstorm Watch, conditions are favorable for weather to become severe. During a Severe Thunderstorm Warning a severe thunderstorm poses an imminent danger to life and property to those in the path of the storm. 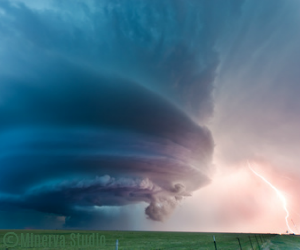 Homeland Security wants you to remember the mantra, "When thunder roars, go indoors." That's because where there is thunder, there is typically lightning--which stikes 10 to 15 miles away from the storm. July is the month when most lightning incidents take place, with June and August following behind respectively. While your odds of being hit by lightning in your lifetime in the U.S. is 1/14,600, Texas ranks second in the U.S. for the most lightning fatalities between 2008-2017. (Florida holds first place.) In that same time period, Texas led the U.S. in average flashes of lightning. Lots of statistics? Yup, but that's because we want you to take the threat of lightning seriously. After all, each year there are an average 45 deaths and over 500 injuries due to lightning across the U.S.
Brush up on your lightning facts at the link above so you are prepared during a thunderstorm. Should you stand under a tree during a thunderstorm? No. Is it safe to stay outdoors if I hear thunder but don't see a storm? No. Am I safe swimming or on a boat during a thunderstorm? No. The National Fire Protection Association reports during 2007-2011, U.S. local fire departments responded to an estimated average of 22,600 fires per year that were started by lightning. "If you hear and feel a lightning strike, call 911 immediately," said Fire Marshal Mike Smith. Consider installing a lightning protection system for your home, which can be installed either during or post construction. Read more here. Imagine a baseball coming at you at 120 mph; you'd take cover, right? Well, that's what the National Weather Service states it would be like to be hit by hail. Hail that has fallen within Collin County has ranged in size from a pea to a softball. Check out this news article for one such storm that hit Wylie in April 2016. In 2016, Texas ranked as number one with the most hail events by the Insurance Information Institute. Please see our full page dedicated to tornadoes here. Download The Weather Channel app on your smartphone and turn your notifications to "on". Take these warnings seriously. The notifications will typically identify cities threatened by the storm and provide instructions on what to do. Additionally, stay away from windows. 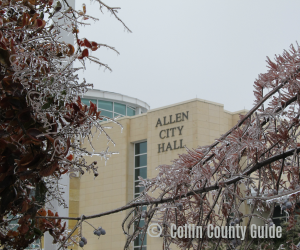 It's pretty rare that we receive snow here in Collin County, but we are subject to our share of ice storms. While chains on your tires may work well to get around the mountains of California in a snow storm, they won't be that much help in a North Texas ice storm. (I know, because with the chains on, I ended up in a ditch creeping my way along the road.) Bridges and overpasses are particularly dangerous because they freeze before other surfaces. The National Weather Service warns that even small accumulations of ice can be extremely dangerous. Winter ice storms provide unexpected breaks from routine and an opportunity to cozy up with your family. In winter months, keep enough food around to last several days. Be prepared for a power outage by purchasing alternative power sources, such as a gasoline operated generator and back-up batteries for your phone. If the power goes out, limit the number of times you open your refrigerator and freezer to keep food from spoiling. Have warm blankets and coats handy. During an ice storm, stay off the roads. We're not going to lie to you. It gets hot here in the summer months. If you Google any of the cities in our area such as "Plano TX climate", you'll get a result that shows the average summer temps to be 95°/76°. Don't believe it. It's not unusual for temps to exceed 100° Fahrenheit for days at a time. Those triple digit temps don't typically last all summer and we often will still receive rain. The warmer climate means we get to avoid the heavy snow storms of the northern states. Walk indoors when possible, keeping the outdoor portion of the walk as short as you can. If you enjoy exercising outdoors, plan to do so at the coolest part of the day. Know that you WILL need air conditioning in your car and in your home. Get a sun shade for the front windows of your auto. Freeze a water bottle and you'll have cold water for hours. Allow the garden hose to run before spraying water on animals or humans. While this story took place in Las Vegas, a garden hose sitting out in 90° F temperatures for a couple of hours can raise the water inside the hose to 120°. Details. Take precautions at playgrounds. Playground equipment, asphalt and concrete can get very hot and result in burns. Look for playgrounds in shaded areas, wear shoes at the playground, and consider taking a rug for covering swings, slides, and other equipment. Click here for an excellent story covering this topic. Wear protective clothing and sunscreen if playing outdoors. Damage other than sun burn may not show up for years. According to one study UV rays are responsible for 80% of visible facial aging signs. Do not leave children, or pets, in an unattended car. Heatstroke fatalities have occurred even in vehicles parked in shaded areas and when the air temperatures were 80° F or less. An outside temperature in the mid-60s can cause a vehicle's inside temperature to rise above 110 degrees F. The inside temperature of your car can rise almost 20 degrees F within the first 10 minutes. Details. This article has been created through research with the proper authorities or through personal experience. It does not replace legal advice. If you have legal questions, we recommend you contact an attorney.